The State History Museum in Red Square in Moscow. Simply stepping onto the cobbles of Red Square is an experience in itself, but taking the time to explore the sights scattered in the vicinity is well worth it. Red Square is Russia's and Moscow's most iconic square. The color red is historically associated with beauty in the country, hence the name of the square. So Red Square is the most beautiful square in the land, right next to the Kremlin walls. There are probably very few people in the world who haven’t seen a postcard or image of the stunning space, or who haven’t heard about the mausoleum where the leader of Russia’s 1917 Revolution, Vladimir Lenin, is frozen in eternity. However, there are other fascinating sights to take in on the famous cobbles, not to mention a number of great festivals. You can’t miss this red-brick building – it’s huge and meets you when you first step onto Red Square from the side of the Teatralnaya, Okhotny Ryad, or Ploshchad Revolyutsii metro stations. Don’t be fooled, the museum may look like a 16th century ancient Russian architectural masterpiece, but it was in fact built during the 19th century under the order of Tsar Alexander II. 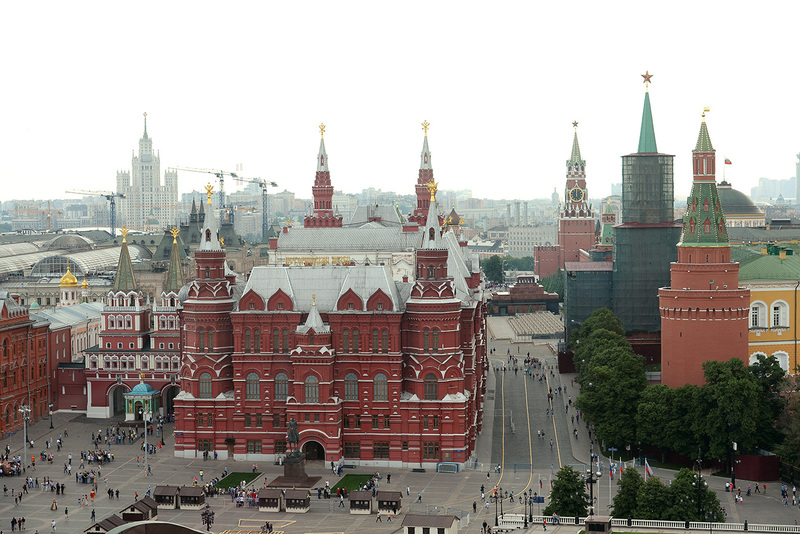 The architects were asked to construct the building so that it would fit in with style of Red Square and the Kremlin. The museum's permanent exhibition is really interesting. The family tree of Russian tsars is painted on the ceiling of the parade hall. Aside from the ancient history and 20th century exhibitions, the museum also holds different shows throughout the year. On the left hand side of the entrance to Red Square through the Voskresenskie Gates, you can see the Cathedral of Our Lady of Kazan – or just Kazan Cathedral – a small cozy church full of golden icons. You can see the icon of Our Lady of Kazan just above the door, it’s one of the most worshipped Orthodox images in Russia. The church was first built in 1625 and after being destroyed during the Soviet times was rebuilt in the 1990s. During ancient times Red Square held big trade markets. Trade still happens here, but these days it’s far more luxury. GUM comprises scores of high-end shops for those feeling frivolous, not to mention a number of food stalls offering delicious ice cream and other treats. The building is a huge arched construction made of steel and glass designed by famous engineer Vladimir Shukhov. By the way, inside there is a great café with a spectacular view over Red Square and the Kremlin walls. Another place worth visiting is Gastronom No 1, where you can buy caviar and vodka. As Russia’s main square, it has witnessed a number of important historical events.The Lobnoye mesto stone platform was mentioned in chronicles dating back to Ivan the Terrible’s reign. There’s a legend that Lobnoye mesto was used for public execution, but only rarely. Instead, it was most likely used as a speaker’s platform for public addresses. A mass execution took place here in 1698, when the Streltsy (Moscow’s army division) took part in an uprising. There is even a picture of Vasily Surikov called "The morning of Streltsy execution." This cathedral is probably one of the most recognizable symbols of Moscow and Russia, replicated on thousands of postcards and souvenirs. St. Basil's was built by Ivan the Terrible in 1555 to 1561 in memory of the annexation of Kazan and the victory under Khanate of Kazan. It's worth not only exploring from the outside and taking pictures, but also having a look inside – the murals inside the cupolas are stunning. While the leader of 1917 Russian Revolution, Vladimir Lenin, is lying in his Mausoleum, most of the Soviet authorities and figures are buried right in Kremlin walls, including Joseph Stalin who actually lied next to Lenin in the Mausoleum until 1961, but was eventually removed. Strolling around the Kremlin necropolis you can see the whole story of the USSR: Ministers, all the Soviet marshals, Yuri Gagarin, Maxim Gorky, and many others had an honor of being buried here. The last man who was laid to rest in the walls was Soviet leader Konstantin Chernenko in 1985. Red Square hosts a variety of festivals, concerts, and entertainment events. June 3 to 6 will see a major book fair with more than 500 publishing houses from all over Russia represented. The entrance will be free. July 12 will see Moscow City Racing, a dream for Formula 1 fans. The high-octane route will whizz around the Kremlin walls, and people will be able to see race drivers from the Red Bull, Scuderia Ferrari, Lotus, and McLaren-Mercedes teams. July 22 will a see retro car rally, the entrance to which is free. One hundred Soviet cars made in 1970-1980 will be exhibited next to GUM before driving in convoy across the city. Every year Dec. 1 sees the opening of a great ice-rink right on Red Square. Next to it a Christmas and New Year fair are held throughout the cold months – you can try Russian dishes, drink hot wine, buy Russian handicrafts, or just have fun there.